Located on a quiet cul de sac and double lot just steps from the beach, this elevated traditional southern home offers plenty of space both inside and out and is an ideal choice for your next family vacation! Be sure to bring the Frisbee and lawn games to take full advantage of the huge front yard, or simply lay out a blanket and enjoy the warm sun and relaxing breeze! The full front porch with rockers is perfect for those seeking some cool shade and enjoying your morning paper. As you enter the home, you are greeted by a spacious living area with vaulted ceilings, a fireplace, ceiling fans and a new 46" flat screen with DVD. Adjacent to the living area is the fully equipped, albeit dated, kitchen with bar seating for four. The formal dining room offers seating for 10. Also on the main floor is the first master featuring a private bath with Jacuzzi tub, 26" flat screen with DVD and direct access to the screen porch and back deck with gas grill. 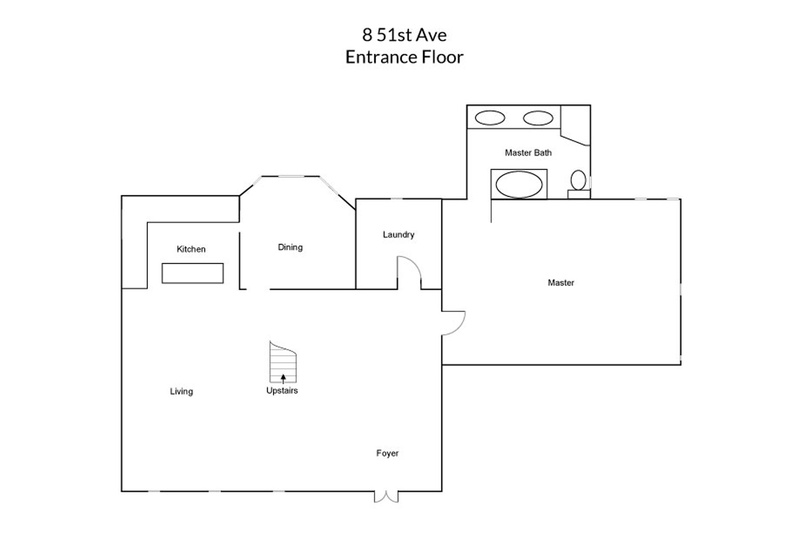 Other features of the first floor include a laundry room with washer and dryer, wood floors throughout and direct access to the three car garage. Located on the second floor are the remaining four bedrooms, all carpeted and TV's and DVD in three of the four. This home is "Pet Friendly" with a $200 non refundable fee. No smoking. Wireless Internet. Linens included. Take a virtual tour to truly explore this home. Bedroom 5: 4 Twins. This room has a window unit AC and is not connected to central heat and air. Great location. Short walk to beach. House has lots of space. Downstairs master and side screened porch really nice. Great room furniture needs update.Larger microwave would be helpful. House is nice but furniture is in bad shape. There needs to be a investment in improving the furniture. Bed collapsed. Dressers all broke. Chairs in disrepair. Sofa sinks to the floor. It would be a great place if the furniture was as good as the house. Thank you for your comments. We have since repaired the bed after the report of kids jumping on it and breaking the frame. We will be sure to look into the sofa and dresser drawers as well to make sure they are repaired. Good. House was sufficient size for our 7 guests. This was a new house for us this year. We were pleased with the location and general appearance of the property. However, the house can sleep 12 people, but was not furnished for that many. There was a shortage of silverware, serving dishes and pots and pans. Also there were only three chairs on the front porch. The property needs updating - the kitchen cabinets were in terrible shape, and the appliances were well worn. The mattresses all need to be replaced. The sofas are in horrible shape - when you "fell" in it was hard to get out. That said, we will be back another time. The house has a good layout. Cabinets are in need of some repairs and it would have helped us to have some more pots/pans, etc. the front porch was lovely, enjoyed the shade tree and ability to see the ocean from the porch. New house going up next door, not sure if this will affect view. Location is good and beach isn’t crowded. There was a lot of rain in the weeks prior to our arrival so the beach access, as well as most nearby, was flooded. Beach access otherwise very convenient. Yard also very wet from rain so we couldn’t use for games, but would nicely accommodate yard games. Island realty very helpful. House is pet friendly, but overall very clean when we arrived (we brought no pets). We did use a lint brush to get some remaining pet hair off the sofas. Overall, we had a wonderful time.We did not have to cross the road to get to the beach. There was plenty of room to spread out. There were a few hiccups with the house, but Island Realty responded to me within 30 minutes and all was well before the end of the day. Still can't get over how quickly they responded!!! The house owner needs to invest some money into paint, having the shrubs and palms trimmed, restocking kitchen cookware. However, none of this affected our vacation (maybe the 1 lumpy queen bed). The property manager needs to walk the property after every 3rd rental, going behind the cleaning service. The service could do a better job. But, again, this did not keep us from having a great time. We WOULD rent this house again! Thank you so much for your comments. We are so glad to hear you enjoyed your stay. We will be sure to pass along your comments to the owner in hopes that the will make some improvement. We look forward to seeing you again soon. Used Island Realty and got a great vacation house. entire family stayed and had a great time. Wonderful beach that was not crowded. Thank you so much for your comments. We are so glad to hear you enjoyed your stay. We hope to see you again soon. Beautiful home just 1/2 block from the beach with large master suite,deck and plenty of beds and bedrooms for our family of 6 adults and 5 kids. Rocking chairs on the porch with a cool ocean breeze. There were a few minor maintenance issues that could be improved. Thank you for your comments. We are so glad to hear your enjoyed your stay. We have let the owner know about a new for some updating in the kitchen and baths and hope to have them updated this off season to make sure guests have a better experience. We look forward to seeing you again soon. The view from the porch was beautiful. The porch was well shaded and made for a great place to hang out, enjoy the breeze, and look out towards the beach. Easy walk to the beach. The kitchen did not have a lot of dishes or cookware. It would be difficult to prepare meals. The cabinets were not in great shape and most of the mattresses were not very comfortable. Thank you for your comments. We are so glad to hear you enjoyed your stay. We will be sure to relay this information to the home owners in hopes of improving upon the house to help make for a better stay. We look forward to seeing you again soon. The rental was perfect for what we needed. The beds were great and the house was clean. The front yard was perfect for lawn sports and the short walk to the beach was perfect. The location was perfect. The layout of the house is great. The house is a little long in the tooth. It could use some general maintenance: some windows wouldn't open or wouldn't stay open, some screens were torn. In the upstairs bedroom with the 4 twin beds one of the windows is broken and has a hole in it. The mattresses in that room need to be replaced. I was surprised to discover that there was only one pillow per person (aside from the pillows with shams) provided. The closets were full of extra pillows but there were not cases for them. I was informed by housekeeping that if you wanted pillow cases you would have to pay for them. Also we had 6 young children with us. When we were trying to wash the sand off them at the faucet by the garage we discovered there was broken glass all around it which no one had noticed or cleaned up. Thank you for your comments. The window is currently getting replaced as it appears that a bird may have run into it. I apologize for the glass in the garage and have let the housekeeping know of the issue so it does not happen again. The home was in need of a bit of TLC. Could have supplied more towels in the kitchen and baths however, the kids and I had a wonderful holiday weekend! The location of the home was perfect, the view was outstanding. Would I recommend the property? Yes, but with the clear conversation of what was missing and the repairs that were needed. Don't get me wrong ~ we did the LOVE our stay! We had a wonderful time on our vacation. The house was in a wonderful location adjacent to the beach. The house was perfect for dogs and an extended family.The quiet street and close beach access was great!We loved the area and look forward to visiting again. The location and yard was perfect for our stay with our family and 3 dogs! Could not have asked for better! The house is a little dated, but for the most part clean and very livable. We had a wonderful week! This property was just perfect size for our family. We loved being so close to the beach. Thanks to the property management for all their help solving little problems. It was more than I could have ever imagined! The home was well prepared for guests, clean, and easily accessible to and from the beach. Great parking for your guests too! Thank you for your comments. We are so glad to hear you enjoyed your stay and the house. We hope to see you again soon. Our large family had a comfortable stay in this house. The front porch with the live oak shading it made it possible to be in the rocking chairs most of the day. The walk to the beach was short and easy to manage. We reported several issues with house maintenance to the realty company as we left. There is an outdoor shower but it is not enclosed in a stall as I would have liked. Great weekend.Always pleased with Island Realty.